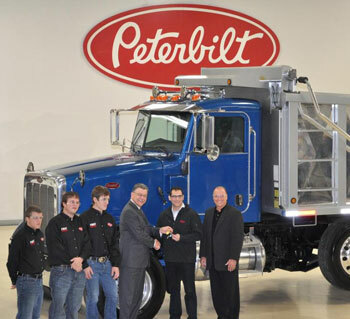 Peterbilt Motors Company recently announced the donation of a Peterbilt Model 365 to the First Response Team of America to help in their ongoing disaster relief efforts throughout the United States. The Model 365 was presented to Tad Agoglia, president and founder of the First Response Team, during an event at the Denton Plant on December 16th. The Model 365 dump truck features improved ride and handling capabilities and optimized maneuverability to assist the First Response Team through obstructed environments. An all-aluminum cab with lap seam construction, air-craft grade fasteners and bulkhead style doors provides increased durability, while enhanced weight distribution offers an increased payload to maximize debris removal. Also, the robust pod headlamps feature halogen reflector technology providing exceptional nighttime visibility to help guide the First Response Team through night, and help keep them out of harm’s way.